The monarch (Danaus plexippus) is unique among butterflies because of their long distance, round trip migrations. These migrations are considered "endangered biological phenomena." Current migration theories describe two distinct populations of butterflies: one which breeds east of the Rocky Mountains and overwinters in central Mexico, and one which breeds west of the Rocky Mountains and overwinters on the California coast. However, observations suggest that this two population/east-west model fails to describe the complexities in western monarch movements, which may also include influxes of eastern monarchs. 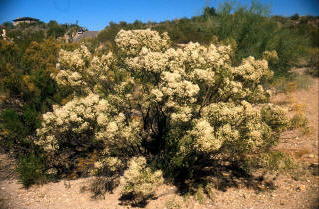 Monarchs are known to move along corridors in southern Arizona and Sonora. Nectar resources in this region are threatened by agriculture, herbicides, and development. While it may take considerable time to define the specific locations of these corridors, it is necessary to implement conservation strategies in the region to ensure perpetuation of monarch migrations. We conducted conservation and education outreach in this region to promote awareness, appreciation, and participation in monarch conservation efforts. The Monarch is a member of the tropical subfamily Danainae that contains 157 species known collectively as "the milkweed butterflies" because the caterpillars feed on plants that produce milky latex, particularly the Asclepiadaceae (Ackery and Vane-Wright 1984, 1985). 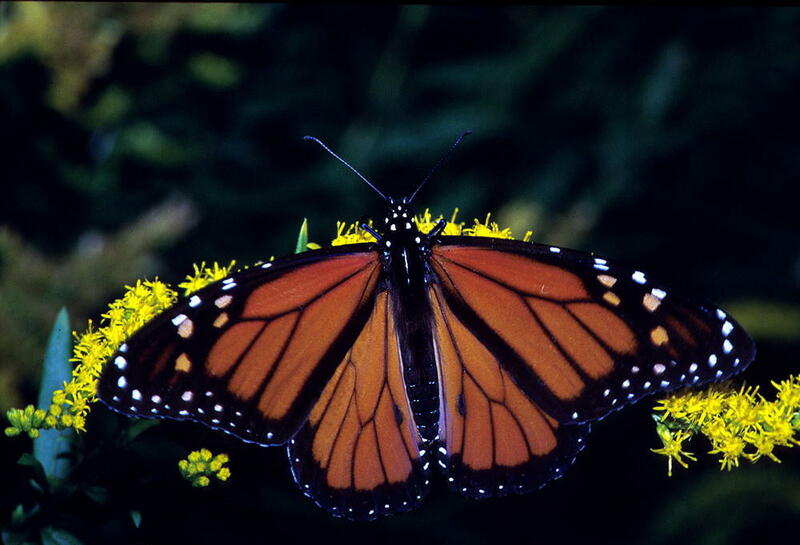 Several danaines are known to migrate, but the monarch is unique in having a very long distance and bird-like migration that involves up to four generations per annual cycle (Brower 1995). This complex behavior allows the monarch to exploit many, if not all, of the 108 species of Asclepias across the North American continent, where it has become one of the most abundant butterflies in the world. Remarkably, and in contrast to vertebrate migrations, orientation and navigation of monarchs to overwintering sites are carried out by descendants three or more generations removed from their migrant forebears, thus there is no opportunity to learn the migratory routes. Its fall migration is, therefore, an inherited behavior pattern (Brower 1996). The long distance North American migration of monarchs and the extraordinary aggregations of up to tens of millions of individuals overwintering in Mexico and hundreds of thousands in California are considered "endangered biological phenomena" (Brower and Pyle 1980, Wells et al. 1983, Pyle 1983a, 1983b, 1983c, Brower and Malcolm 1989, 1991, Malcolm 1993). Examples of other endangered phenomena include scores of animal migrations that are being disrupted by accelerating habitat modification throughout the world (Brower 1997). The current monarch migration paradigm describes two separate populations of monarchs. The first is a population that breeds during the summer east of the Rocky Mountains and migrates to 12 mountain massifs in central Mexico to overwinter (Brower 1995). The second, and much smaller population breeds west of the Rocky Mountains and migrates to the central Pacific Coast of California to overwinter. While Brower (1995) points out that the demarcation between the two is largely hypothetical, and the degree of natural interchange between them is largely unknown, the model of two distinct populations has become almost universally accepted. This model has been depicted on all subsequent maps of the migration including one in a recent federal survey of monarch conservation efforts (State and Federal Monarch Activities 1997), and another in a large-circulation feature in Sunset magazine (Jenson 2000) that perpetuated the idea with the caption "The Great Divide." Thus, the East-West bifurcation of monarchs on either side of the Continental Divide has become a virtual canon in American natural history. Reexamination of the basis for the East-West Model has shown that it was predicated on very few actual data (Pyle 1999). In fact, the degree of interchange between the eastern and western populations appears to be more extensive than the body of prior evidence indicates (Brower and Pyle in press). Many observation records show monarch movement across the U.S./Mexico border west of the Continental Divide suggesting that there is monarch exchange between Mexico and the western United States (Brower and Pyle in press). The destination of these western monarchs flying into Mexico during the fall is unknown. Also, L. Brower and S. Gauthreaux (Brower 1999a) speculated that there may be occasional major influxes of eastern monarchs into the western range, and they proposed a new hypothesis that the long-term survival of the western population may ultimately depend upon these large influxes. It is clear that the old East-West Model fails to describe the whole of the monarch movement in the west. Although details remain unclear, the fact seems inescapable that the western population of monarchs contributes fall emigrants to both Mexico and California, and in turn receives spring immigrants from both Mexico and the eastern population (Brower and Pyle in press). Further research is necessary to define how the western monarch population divides and interacts with the eastern population. Our goals were to provide monarch education outreach to schools and communities in the region and to record all observations of monarchs and their movements. Monarchs have been observed to fly south along the San Pedro River and through Guadalupe Canyon in southeastern Arizona continuing into Mexico. They have also been recorded flying south through Buenos Aires National Wildlife Refuge and Organ Pipe Cactus National Monument in southern Arizona continuing south across the border. We observed monarchs in Sonora in late summer, fall, and early spring including a migratory cloud of monarchs flying south near Trincheras, Sonora in October of 2001 (Table 10). These sightings are significantly west of the eastern population's southerly migration routes. Since migratory corridors are now believed to exist between Arizona and Sonora based on these records, it is crucial that we prepare conservation strategies for these areas. Monarchs are just one of many species of butterflies and moths that utilize these corridors. Although the other lepidopterans are largely if not completely emigratory rather than round trip migrants like monarchs, they also perform significant pollination services and require copious nectar during their peak seasons. In fact, nectar availability in the spring has been put forth as a determining factor for major irruptions of many lepidopteran species (Pyle 1981, Scott 1986). The importance of nectar plants along migratory corridors has been addressed by Garc�a and Equihau-Zamora (1997) and can be intuited by observing the large numbers of butterflies and moths nectaring on such fall-blooming shrubs as rabbitbrush (Ericameria nauseosa) and desert broom (Baccharis spp.). 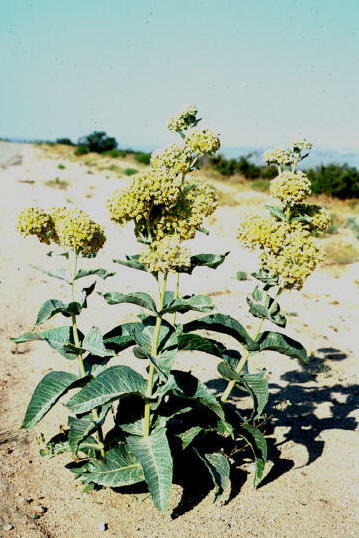 Other genera frequently employed by western monarchs during their migration include Aster, Helianthus, Solidago, Verbena, Trifolium, and Asclepias (Pyle 1999). 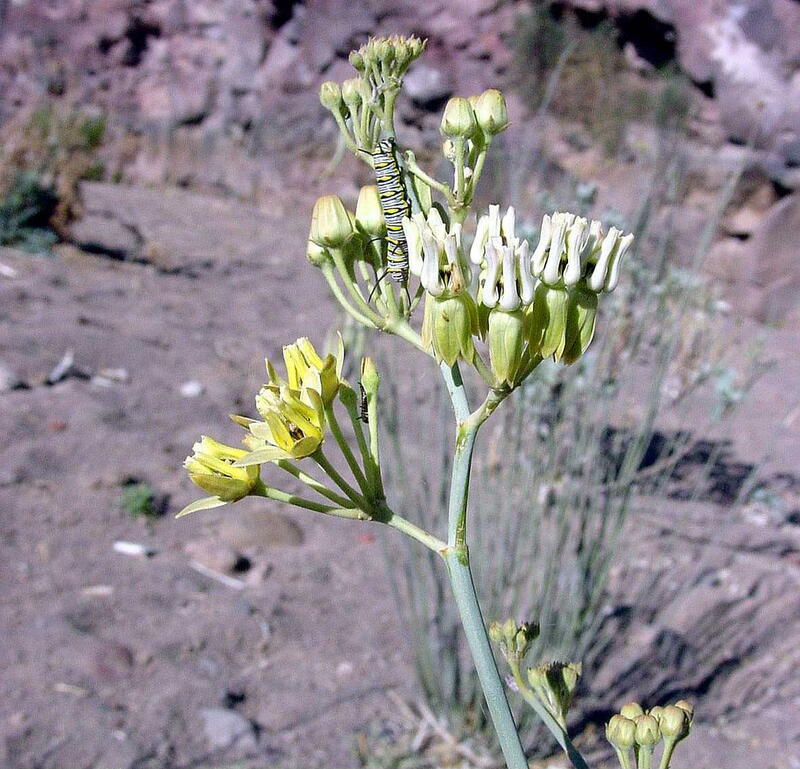 Asclepias subulata provides food for both larvae and adult butterflies despite its leafless habit. Whole milkweed plant is in background. Caterpillar is of a queen butterfly. Extreme lipid loading of monarchs has been observed during the southward migration through Texas and northern Mexico (Brower 1985, Alonso-Mejia et al. 1997) and yet a significant proportion of monarchs that arrive in Mexico lack sufficient lipids to survive the winter. Extensive nectar drinking during the spring migration has also been reported by Heitzman (1962). Clearly, the flora along migratory corridors is crucial for the survival of migrating monarchs. Herbicides, agriculture, development, and any other factors that reduce available nectar resources along the migratory pathways and corridors have deleterious effects upon monarchs and their ability to reach both their winter clusters and summer breeding grounds (Brower 1999b). It will likely take many years before the specific corridors used by western monarchs to migrate into Mexico in the fall and to remigrate to the western U.S. in the spring are well defined. As such, it was beyond the scope of this project to identify these corridors. Rather, we focused our efforts on extensive public outreach programs to increase awareness, appreciation, and understanding of monarch butterflies as well as encourage participation in conservation efforts. Brower and Pyle (in press) suggest that promoting nectar-rich river valleys, roadsides, neighborhoods, parks, gardens, and public lands along the migratory corridors are important for preserving the monarch migration. It is believed that patchy nectar sources may be as important as concentrated stands of preferred plants (Brown and Chippendale 1974). We conducted migratory pollinator workshops for schools, the general public, ecotourists, and businesses throughout the migratory region. These programs disseminated information on monarch natural history, migration, and conservation. We also prepared a Desert Pollinators Garden Kit and encouraged the planting of nectar rich plant species in school, business, backyard, neighborhood, and park gardens and on public lands. More details on our outreach program are provided in the Outreach Chapter of this report. Contrary to previous belief, some western monarchs are now thought to migrate south to overwinter in Mexico. Occasional major influxes of eastern monarchs into the western range may be helping to sustain western monarch populations. The specific routes used in these movements are not well understood. Monarchs, and other trans-border butterfly and moth immigrants, play an important role in pollination systems in the Southwest. Monarchs depend upon reliable floral resources during migration southward into Mexico in the fall and northward into the U.S. in the spring. Many monarchs are lipid deprived upon reaching their overwintering grounds and subsequently die.